Total Burn Care guides you in providing optimal burn care and maximizing recovery, from resuscitation through reconstruction to rehabilitation! Using an integrated, "team" approach, leading authority David N. Herndon, MD, FACS helps you meet the clinical, physical, psychological, and social needs of every patient. With Total Burn Care, you'll offer effective burn management every step of the way! Effectively manage burn patients from their initial presentation through long-term rehabilitation. Devise successful integrated treatment programs for different groups of patients, such as elderly and pediatric patients. 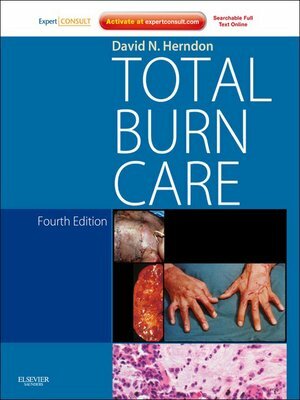 Browse the complete contents of Total Burn Care online and download images, tables, figures, PowerPoint presentations, procedural videos, and more at www.expertconsult.com! Decrease mortality from massive burns by applying the latest advances in resuscitation, infection control, early coverage of the burn, and management of smoke inhalation and injury. Enhance burn patients' reintegration into society through expanded sections on reconstructive surgery (with an emphasis on early reconstruction), rehabilitation, occupational and physical therapy, respiratory therapy, and ventilator management.